WARNING: Some products may contain chemicals such as DEHP, which is known to the State of California to cause cancer or birth defects or reproductive harm. For more information, go to www.P65Warnings.ca.gov. Important Warning: Magnum Cab Racks are designed to offer a storage solution. They are designed to store chains, straps, cheater bars, etc., depending upon options purchased. Magnum Cab Racks are not intended to be a safety device. They will offer no significant resistance to shifting loads moving into the cab of the truck or other protection in the event of an accident. 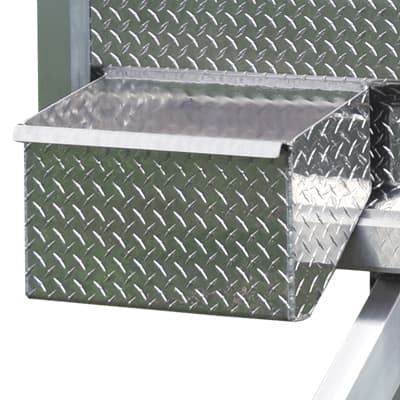 The intended commercial purpose of these racks is additional storage for trucking equipment. Note: Magnum Cab Racks are not to be used with Pole or Log trucks. This is a misapplication and will immediately void all warranties. F3 MFG Inc. makes no representation, either stated or implied, that Magnum Cab Racks provide or increase any driver or passenger safety. 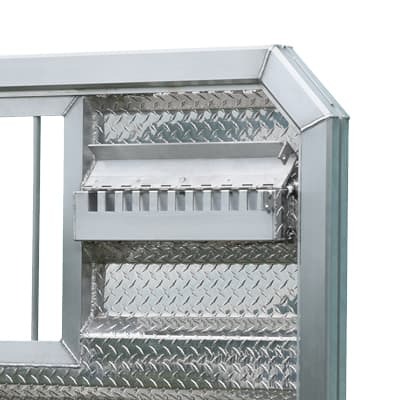 Cab Racks cannot meet the requirements of CFR 393.114.a. Securement of loads shall be per CFR 393.100-393.132. 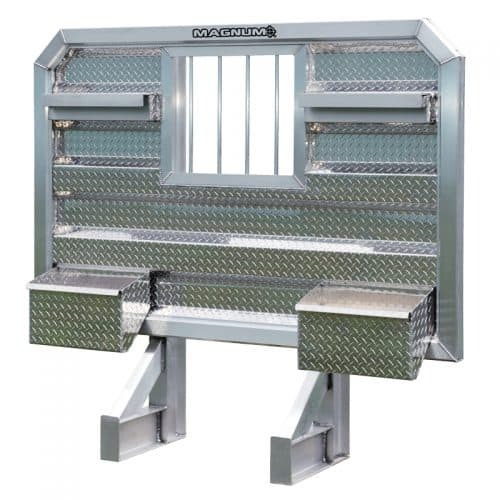 The Magnum cab rack is built from high strength alloy 6063 aluminum. These racks are available with both Tread Plate (diamond plate) back panels or Mill Plate (smooth finish) back panels. 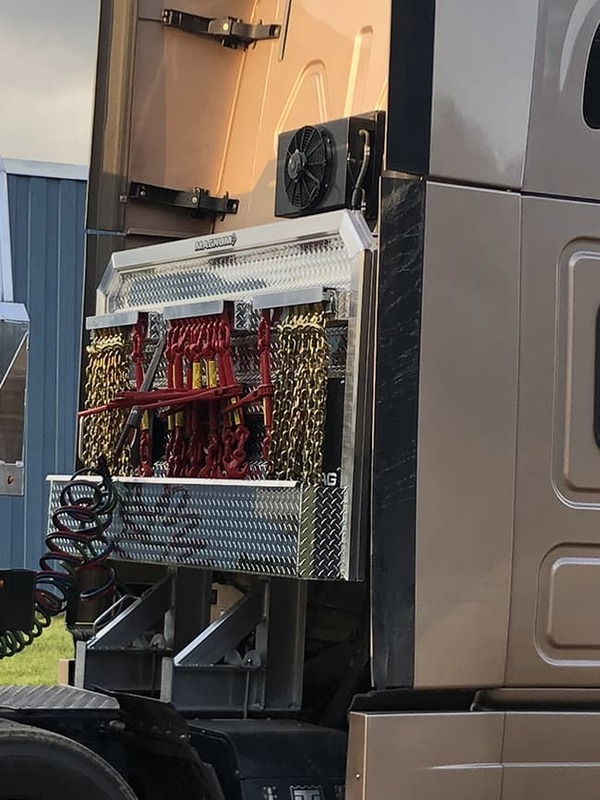 We offer everything from the basic rack with no options to racks with Jailhouse windows, chain holders, trays, and tool boxes or logger boxes. 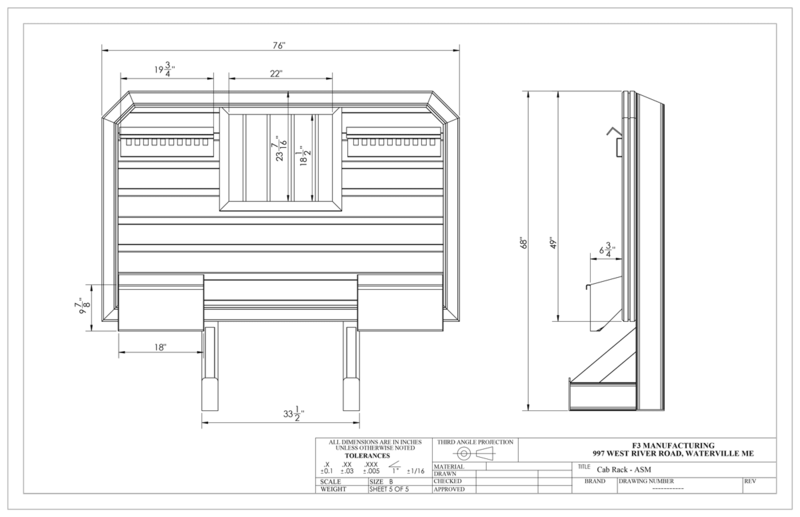 Magnum Cab Racks are currently constructed with rugged 6” I-beams on the base and the rear verticals. Compare this with the industry standard that is 4”or less. Magnum’s perimeter frame is built with the same tested Glide Track that we use in our DuraMag truck body headboards. This allows for fast, easy mounting of lights and other accessories (slide in and tighten). Shipping: All prices are delivered Standard Shipping – LTL to a commercial address. Delivery to a residence will be quoted individually. Lead Time: We strive to ship within 3 days of ordering but lead times sometimes extend to 7 working days. LTL Trucking Time: Standard LTL trucking time runs between 5 and 13 days depending upon location. Expedited trucking is available. Please call for a quote (207-660-4700). Closing of this window implies that you have read and acknowledge the information stated below. F3 MFG Inc. will not be liable for any damages or injury incurred as a result of misuse of this product. Maintenance: Routinely inspect your rack for damage or weld cracks and check installation bolts’ torque along with regular vehicle maintenance. Enjoy the commercial purpose of our racks (storage), but don’t rely on them for adding increased safety.